LENIN'S TOMB: Can Corbyn build a 'social movement'? 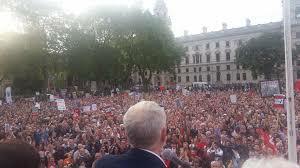 There is an awful lot of fashionable talk about turning the Labour Party into a social movement. And while I understand the thrust of this to be moving in the right direction, I think it's a conception of which we have to be slightly critical and interrogative. In fact, surely we already have reason to be sceptical given the way the term 'social movement' is tossed around so lightly to describe what turn out to be normal electoral campaigns (Obamamania, Sandernismo) or just average party political activity (Luke Akehurst's facile claim that New Labour was a 'social movement'). If we don't want to keep talking loosely and in a way that gives opportunities to our political opponents, we need to problematise what I will call "social movement talk". This is in part because no one really knows what a social movement is, or agrees on its defining characteristics. It is one of those terms, like 'terrorism,' that we sometimes have to use because there isn't a widely current alternative, but which is nonetheless troublingly vague. The idea of a 'social movement' has its origins, in part, in an attempt to overcome the limitations of an older sociological conceit, which is that mass movements are driven by irrational mob passions. Social movement studies tends to stress the constructive, civic role of such movements, and their rational, computational element. There is an obvious benefit from such an approach. The focus of social movement studies, however, as well as its explicit formulations, has often tended to imply a number of unsustainable ideas. The first is the easiest to disprove: that social movements are clearly located on the political left, and are about promoting social change. The history of right-wing social movements from interwar Europe to the Tea Party, which aim to actively suppress social change, really doesn't permit that conclusion. The second is that social movements exist in opposition to, and autonomously from, public authorities. The state, in this perspective, is usually straightforwardly an opponent of such movements. But even the archetypally successful social movement, Civil Rights, depended in significant degree on mobilising state capacities and forming alliances within the field of the state state, as well as beyond it. Obviously its Massive Resistance nemesis was also very well articulated with localised sites of state power. The third is particular to 'new social movement' approaches, which is that the 'social movement' constitute a novel type of political organisation, moving beyond narrow 'materialist' and class-based approaches. This isn't really sustainable, and involves a questionable dichotomy between the 'material' and 'post-material' (as if to say that gay rights, or nuclear weapons, aren't obviously material interests for millions of people). Obviously, social movements scholars have responded to this problem by loosening the definition of a social movement. In broad strokes, then, we could define a social movement as: i.) a sustained, organised public effort involving some non- or extra-institutional action making a claim upon public authorities, ii.) using a particular repertoire of contentious tactics, iii.) to promote or oppose social change. We could then add various other characteristics such as the fact that a social movement usually consists of dense informal networks, forges a distinctive collective identity, and so on. The problem here is that the definition operates at a purely empirical and descriptive level, and depends upon theoretical generalisations that are so indeterminate as to be of questionable utility. What does it mean to say that something is 'sustained', for example? In what sense does any form of political organisation define itself without either promoting or opposing social change? What form of political organisation doesn't make claims on public authorities? Or doesn't form a distinctive collective identity or involve dense informal networks? What is the difference between a campaign and a social movement in this context? What organisations count as 'institutions'? I don't want to make too much of these questions. Some degree of indeterminacy in the social sciences is inevitable. And, for example, 'sustained' can be defined in relative historical terms - social movements historically emerged at the point where the concentrated centralisation of state power ensured that sudden local riots and mob violence were no longer effective - without being precise. But I suggest that we've tended to take the category of 'social movement' for granted, but once you try to pin it down with reference to any of its supposedly determinate characteristics, it becomes incredibly slippery. What has happened here is that a series of social outcomes have been taken to constitute a unitary empirical object, given the label 'social movement', and then presumed to explain the phenomena in question rather than being something that demands explanation. This is what is known as reification. One of the most interesting theories of reification came from Gaston Bachelard who, in his Psychoanalysis of Fire, proposed that there sometimes exist "epistemological obstacles" built into the phenomena themselves, which can make it difficult to apprehend them properly and which permit an unscientific or incorrect apprehension of them to shape the experience of them. Fire was such a phenomenon, inasmuch as its materiality inclines one to view it as a substance or, perhaps, as some sort of spirit. The palpable experience of fire as an 'object' includes of course the appearance and the physical sensations it gives rise to when 'touched'. And once these qualities have been fixed by a certain symbolisation, once we've said that fire is in fact a definite thing - a substance, or an animistic entity - these sensations are experienced as palpable confirmations of the symbolisation. And so it might be with the concept of 'social movements'. The palpable experience of the social movement, then - the familiar displays of 'worthiness, unity, numbers and commitment' above all - can appear as confirmations of the category, so that there only remains the task of working out what essence, historical subjectivity or functional relation coheres all of the various and contradictory manifestations that are attributable to social movements. i. The most basic social unit is not the individual, which is merely a politico-juridical effect of power relations, but the relation. Nothing social happens until there is a relationship (be it political, ideological or economic) between at least two types of agent. ii. These relations are organised within a particular mode of production, which assigns agents within them particular capacities and powers, depending on their dominance or subjugation. iii. The dominant relations in a given mode of production, insofar as it is characterised by exploitation, are antagonistic, thus leaving the social field cross-sected by struggles. iv. The mode of production is never fully 'realised'. It is always only realised to an extent within an open, complex and generative structure-in-difference, or social formation. It is the social formation in a given conjuncture, not the mode of production, that is the terrain of action of social forces. v. For relations to persist, they must be reproduced, and thus the manner of their reproduction, as well as the productive forces available to them to continue doing so, is decisive. These premises stress a processual perspective, and it in that perspective that we can start to locate the social movement. First of all, we can say that a condition for the emergence of a social movement is that the reproduction of a given social relationship has been put into question. Thus, a movement will be concerned with the conservation, disruption, reform, abolition or expanded reproduction of a set of social relations. That allows us to broadly comprehend the character of social movements (as reactionary, conservative, reformist, revolutionary, etc). A second condition for the emergence of a social movement is that social groups who are in an antagonistic relationship with one another come into direct (though overdetermined) conflict. In addition, and given that the reproduction of a social relation is necessarily a political issue, a third condition is that the emerging combatants must have some reference to political power - that is the state - the nature of which is structured by the differential access of classes and social groups to the state and the opportunities for mobilisation it provides. A fourth is that, given the overdetermination of political struggles, the participants in the conflict extend beyond those directly involved in the antagonistic relationship in question, and draws into movement those who have heterogeneous interests and ideologies. This necessitates what Gramsci termed a 'system of alliances' governed by a shared structure of meaning (sometimes called 'framing') which may extend well beyond the specific politicality of the movement and even involve a richly complex 'way of life' or several (like cooperativism, unionism, membership of military clubs, 'Klankraft', etc). The specific social capacities arising from social relations whose reproduction has been put into question must be activated in that conflict - this is the fifth condition. These can be class capacities, endowed by one's place in the relations of production (capitalists enjoy control of markets, workers enjoy collective strength, etc) but one can also speak more generally (following Piven and Cloward) of 'disruptive capacities' which follow from one's ability to withdraw one's contribution to the reproduction of society. Since these capacities are distributed unevenly, and formed in relation to different identities and ways of life, the specific organisation of these capacities is subordinate to the political and ideological aspects of coalition forming. Finally, these social capacities can only be convoked in particular spatial contexts (say, big urban settings) in which economic, political and ideological relations are concentrated. As Manuel Castells wrote, the segmentation of social and political space is a way of organising production relations, consumption patterns, sociality, social reproduction, and so on. That is to say, there is necessarily a territoriality to the action of social movements, which structures their options and prospects. They make a claim to the 'national' space, but they operate only within definite enclaves. If you think about this in relation to the most famous social movement, Civil Rights, it was very much a movement of big cities, whereas Massive Resistance was a movement of small towns and the rural Delta. Given that white-supremacy was organised primarily on the basis of the 'internal frontier', mapping race to place, the social-demographic shifts of African Americans to urban areas provided unique opportunities to break the old authority structures and produce new forms of collectivity. Arguably, Massive Resistance was limited by its rootedness in most places (not Arkansas, for interesting reasons) in the declining rural terrain. So, looking at it like this, we could say that a social movement occurs where the reproduction of a social relation has been put into question; the antagonism between social groups has been forced into outright conflict; and the conflict has drawn in combatants from beyond those directly affected and given rise to a complex system of alliances between people with heterogeneous interests, ideologies and social capacities. Its chances of success depend a great deal on how those capacities are distributed and spatially assembled, and also on how the combatants are politically and ideologically unified despite great variations. This obviously poses a number of problems for "social movement talk". This kind of talk almost always implies a kind of voluntarism, as if one can just summon a political movement into existence, or as if it's just a matter of the correct techniques. In a way, when you read a lot of social movement literature, it almost does appear as if it's just a political technology, since the outcomes it embodies have been subtracted from the social processes they emerged from. One can emulate the aesthetic and methods of movement-building, participate in movements, and support the development of movements, but one can't make a social movement come into existence any more than one can force a crisis in the relations of production. And the conflation of social movements with normal electioneering or party activity may be a by-product of the reification, which produces definitions so vague that the mere appearance of a series of big crowd waving signs, or even the existence of a large group of people organised somewhere, somehow, is taken as a 'social movement'. But an election campaign has only one goal, and that is to elect the candidate, and while movement-like phenomena can arise in the context of such a campaign, if it shuts down the second the campaign is over then it wasn't a social movement. By the same token, a political party is both broader and narrower than a social movement. A party doesn't restrict its purview to the reproduction (or not) of one problematic social relation, but has a programme for the whole extended reproduction (or not) of the social formation and its entire future direction. It is necessarily less ideologically heterogeneous on this account than a social movement. And it is necessarily routinised, bureaucratised and hierarchically arranged, especially to the extent that it is integrated into the state, in a way that would be far less exhaustively true of the social movement, which exceeds both its politicality and its formal organisation. A party can therefore be 'powered' by a social movement - you can have "people powered politics" provided there are actually people in movement - but it can't be the movement. One could go on. At best, "social movement talk" is a way of metaphorically addressing the urgent need to remedy the lack of democracy in our political structures, the need to reverse the effective exclusion of millions of people from politics in the neoliberal era, and the need for any party aspiring to social change to ground itself in the organisation and mobilisation of heterogeneous masses. It's a way of saying that there is more - much more - to social power than just getting the right team elected to office. And there's nothing wrong with that. But we shouldn't be hypnotised by the apparent phenomena of social movements, the "palpable confirmations", the appearance of committed and unified people in numbers, as if that was the movement. And we shouldn't lose sight of how beholden any authentic social movement strategy is to factors and contexts that lie beyond anyone's control, and how vainglorious it potentially is to decide in advance that we are a social movement.